Slidecrew will help you to take care of the speakers needs in a simple way. The presentation management tools give the organization overview and control of your program. 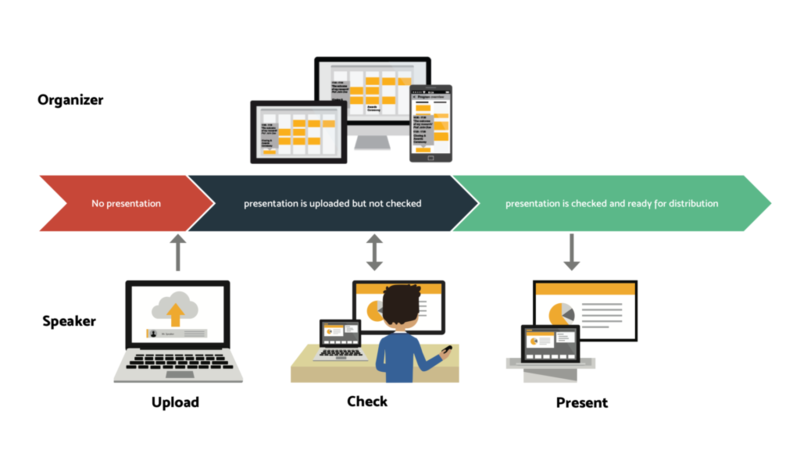 monitor the real-time progress of presentations during the event. Our products are connected in the cloud to this Web Portal. This way we ensuring an easily managed event from any device, anywhere in the world. Check: When uploaded, the file is automatically analysed. If present errors are shown to the speaker. These files can later be adjusted by the organizers or at the Speaker Service Center. Present: Presentations can be run from a laptop at the lectern or a laptop at the room technician’s desk.